The intensive Hand on course is for 4 days consisting of Basic Upper and Lower GI Endoscopy Course from 16th to 19th of every month. Candidate can opt for four days course of only upper or lower GI endoscopy if they want. 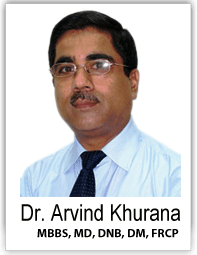 Dr. Arvind Kumar Khurana , MBBS, MD (Medicine), DNB (Medicine), DM (Gastroenterology), FRCP. Dr. Arvind Kumar Khurana is a Senior Consultant Gastroenterologist and head department gastroenterology. Foreign body removal and PEG depend upon individual skill. The course fee is 1700 USD for Overseas candidate and 67,000 Rupees for Indian Candidates. There is initial registration charge of 100 USD or Rs 5,000. This initial registration charge will be deducted from the total fee. The remaining fee will be payable at the time of joining the course. World Laparoscopy Hospital offers you multiple payment methods. Whatever your online mode of payment, you can rest assured that our trusted payment gateway use secure encryption technology to keep your transaction details confidential at all times. Certificate of Training will be awarded by WALS. CME certificate is awarded by World Laparoscopy Hospital. Course study material as teaching resources (textbooks, atlases, videotapes, electronic media) into the training program provided free with the course. For pleasant memorable stay of trainee doctors we have hostel accommodation available at very nominal cost. Hospital has its own transport facility to bring surgeons to hospital. Endoscopic training comprises of the rigorous 6 hours daily Hands On training of all essential upper and lower GI endoscopic procedures. This course is scientifically designed according to international protocol of endoscopic education proven to learn Minimally invasive endoscopic technique. Our minimally invasive endoscopic training will not end just imparting hands on skill but post training Online support is also provided through world's largest and most updated Online library of endoscopic study material (Videos, Articles, Power Point presentations, eBooks) kept for members only on our dedicated server. We provide endoscopic study materials of worth 3000 USD free during course. Free endoscopic study material to complement practical knowledge is provided with the course. The course fee for Upper and Lower GI endoscopy is 67,000 Rupees for Indian surgeons and 1700 USD for overseas surgeon and NRI. Accommodation is available and the Tariff is subsidized. Hospital has its own deluxe bus to bring surgeons to hospital. Please note that living expenses (Food, Travel, Stationary, and Laundry etc.) are not covered in the course fee but working lunch, snacks tea and coffee will be provided whole day during course, free of cost. There is no extra charge to utilize hospital resources like internet, endoscopic instruments, O. T. Dress, Library, Videos, CDs. Learn more about the accommodation. Admission is on first come first serve basis but if the applicant are more for same month candidate has to take Online entrance exam. Candidates must hold M.B; B.S or equivalent and at least 3 years post-registration experience in General surgery or Medicine or degree of M.S or M.D for Indian candidates. Doctors should have valid medical registration. Overseas Doctor should have equivalent qualification. Exam of Fellowship has to be cleared.